The healthcare industry has for long been skeptical about incorporating up and coming technologies primarily due to the safety and compliance issues. However, the scenario is changing with the advancements in the technologies that provide far greater advantages in comparison to limitations. By leveraging technologies such as telehealth, IoT, cloud computing, AI, AR, VR, and others, the healthcare providers can offer more effective, efficient, and quick care to their patients at more affordable costs. In a large country like the U.S., where the people’s access to healthcare is limited, telehealth/telemedicine has proven to be an effective way in extending the reach of healthcare. This is also in tune with the healthcare industry’s growing trend of a patient-centric approach since the patients can reduce the number of visits they have to make to their physicians. The combination of telemedicine and telehealth technologies has resulted in the emergence of the Internet of Medical Things (IoMT). This group of connected devices plays a critical role in the tracking and prevention of many chronic diseases. Additionally, the combination of AR and VR has helped in the treatment of various conditions such as dementia, cognitive impairments, and more. The number of providers in the markets who develop healthcare solutions has increased significantly. 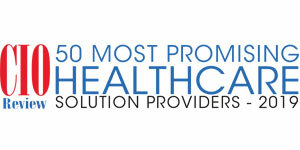 To help healthcare providers in their journey to provide effective and efficient care for their patients, a distinguished selection panel comprising CEOs, CIOs, VCs, and CIOReview’s editorial board has selected a list of the top healthcare solution providers. These companies leverage emerging technologies to come up with practical solutions in healthcare.